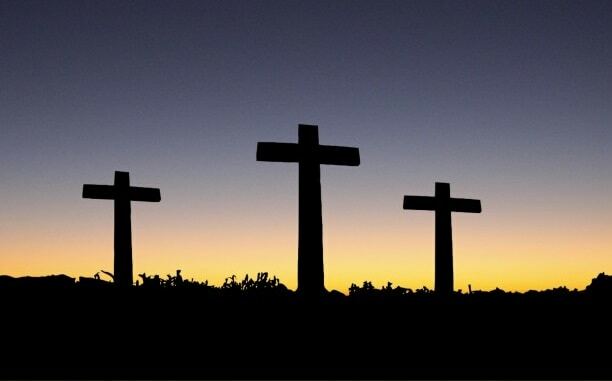 Good Friday comes almost at the end of what Christians call Holy Week. It starts with Jesus’ triumphal entry into Jerusalem on the back of a donkey to cheering crowds (Palm Sunday) and ends with the story of the empty tomb and Jesus’ resurrection (Easter Sunday). His popularity with the crowds at the volatile Passover season (celebrating liberation from slavery in Egypt). The presence of Roman soldiers did not go down well and riots and demonstrations were common. His demonstration in the Temple – probably a prophecy of its impending destruction. Some of his followers thought he was the Jewish Messiah (or God’s anointed one). With the help of Judas, one of Jesus’ 12 disciples, the chief priests have him arrested in the Garden of Gethsemane, tried in a kangaroo court and found guilty of blasphemy, and pass him over to Pilate for execution. After a night time trial before the Jewish authorities, the day starts with the handing over of Jesus to the Roman governor Pontius Pilate. Pilate asks Jesus if he is “King of the Jews”, that is, the promised Jewish Messiah. He goes on to offer the assembled crowd a choice between Jesus and another prisoner, Barabbas, an insurrectionary. Stirred up by the Jewish chief priests, the crowd turn against Jesus and cry for the release of Barabbas and the crucifixion of Jesus, a “verdict” Pilate has little choice but to agree to. Jesus walks to the place of execution, known as Calvary (Golgotha in Aramaic), or the “place of the skull”. He carries his own cross-beam (as was usual), helped by Simon of Cyrene. The soldiers cast lots for Jesus’ garments. The earth becomes dark (presumably a solar eclipse). The Temple curtain is ripped apart, from top to bottom. In Mark’s gospel, Jesus’ death is witnessed by women who have come with him from Galilee. In John’s gospel, Jesus’ mother Mary is at the foot of the cross, along with the Beloved Disciple (John, son of Zebedee). In John, Jesus’ side is pierced by a soldier with a spear. Jesus dies quickly (within three hours). He is buried by a member of the Jewish council, Joseph of Arimathea, in his own tomb. This needs to be done before the start of the Sabbath (at 6pm), after which work must stop. WHERE DID ALL THIS TAKE PLACE? Jesus’ path from Pilate’s headquarters to the place of crucifixion is known as the Via Dolorosa. The traditional site of Jesus’ crucifixion and resurrection is the Church of the Holy Sepulchre (a Christian site has stood on this place since the fourth century). The church houses a rocky outcrop said to be Calvary, and the remains of a first-century tomb (now covered by an elaborate shrine). Protestants tend to prefer another site for the resurrection – the so-called Garden Tomb found in the 19th century. Intense revulsion associated with the cross meant that it took a while before Christians adopted it as their symbol. Crucifixion was banned under the Emperor Constantine in the fourth century, and crucifixes grew in popularity after that. By the 13th century, crucifixion scenes, either paintings or sculptures, formed the focal point of every church altar. While Roman Catholics tend to remember the crucifixion itself in the form of a crucifix, Protestant churches from the Reformation onwards favoured an empty cross as a symbol of the resurrection. A pillar on which Jesus was said to have been scourged (known from the third century). A crown of thorns that appeared in the fifth century was eventually acquired by Louis IX of France. It is now in the Cathedral of Notre-Dame, Paris. Of great importance to the Holy Roman Empire was the Holy Lance, the spear used to pierce Jesus’ side at the crucifixion and said to have been embellished with a nail from the cross. As a symbol of power and authority, kings and emperors took it into battle with them and kept it closely guarded. This is a series of 14 traditional events that took place on the way to Calvary (not all of them are in the gospels): they include Christ’s condemnation by Pilate, three falls and Jesus’ face wiped by St Veronica. Many churches (especially in the Catholic tradition) depict the stations on the walls of the church. Christians walk past each station in turn, reflecting on Christ’s passion and praying. This is especially popular in Lent and on Good Friday. Processions commemorating the Crucifixion take place in Jerusalem every Friday. Elsewhere, they tend to be held on Good Friday, especially in Catholic countries such as Italy, Spain, the Philippines and Malta. Re-enactments of the last days of Jesus became popular in medieval times. Often these were elaborate public dramas, frequently performed by town guilds. The most famous survivor of these plays is that at Oberammergau, first performed in 1634 in honour of a vow made by the Bavarian town to re-enact Jesus’ final days if God spared them from the bubonic plague ravaging the region. The play has been performed every 10 years since. Next showing is in 2020. In recent years, passion plays have become increasingly prominent around the UK. From the Christian perspective, Jesus died to fulfil the will of God as it was laid out in the Jewish scriptures; his death conquered evil and saved people from sin. But death was not the end: Jesus was vindicated by God through the Resurrection, opening up a new way for people to relate to God. In this sense, we can talk of Good Friday. WHY IS THERE A TRADITION OF EATING FISH? Many Christian traditions regard Good Friday as a fast day; meat needs to be avoided, but fish can be eaten instead.